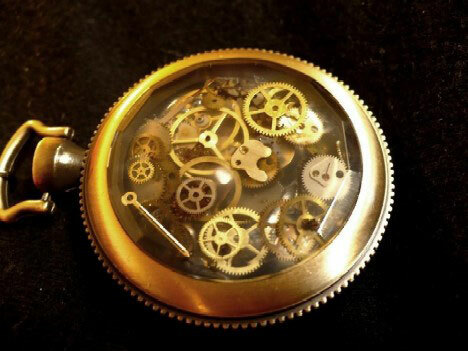 Steampunk art, fashion, design and mods are seen by some as a reaction to today’s generic, plastic gadgets that all look the same until one gets very, very close – practical yes, pleasing no. 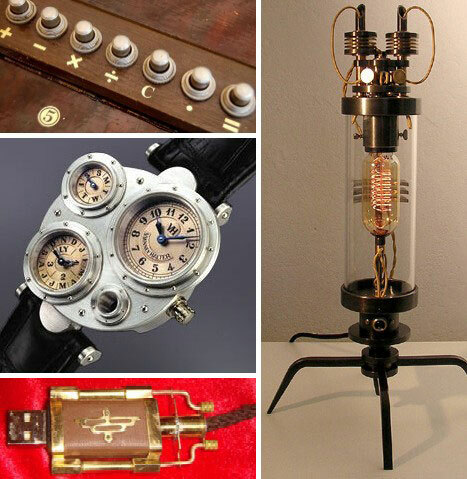 So polish up that monocle, bring on the brass and banish cookie-cutter clutter as Steampunk artists find thirteen more ingenious ways to redesign and refashion the world by hijacking hi-tech back to the future (past)! 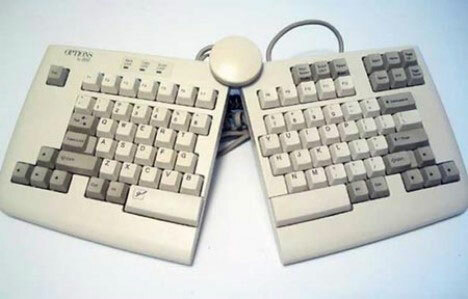 How to take a keyboard from ergonomic to phantasmagoric? Start with an IBM M-15 Ergo Keyboard (shown below), drink one bottle of Absinthe and retire to the laboratory. 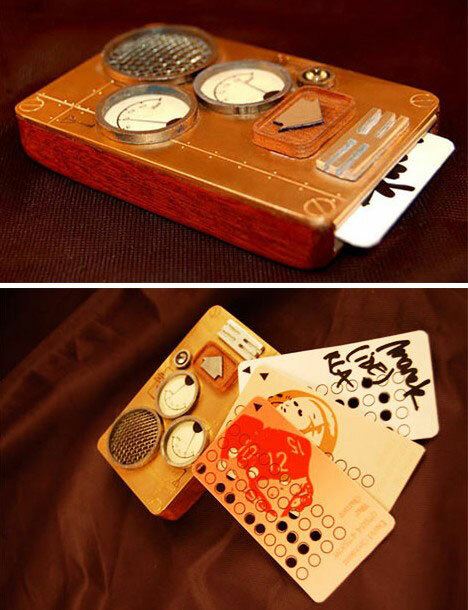 The result may look a lot like this steampunkified deck commissioned by a young lady seeking to express her unique sense of circa-1879 sensibility. 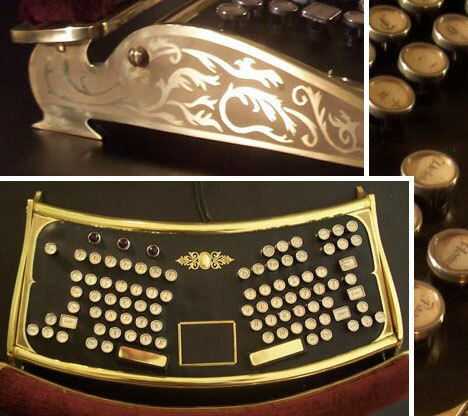 The elegant (and probably very heavy) keyboard features violet-tinted LED lighting, etched brass Acanthus leaf patterns on the sides and a cushy burgundy wrist pad. Smoking jacket and cigarette holder optional. 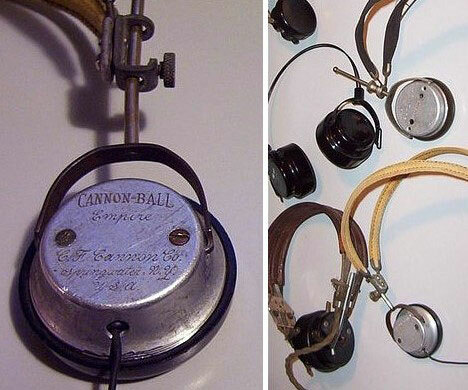 Headphone design hasn’t changed much in the past century, with the exception of earbuds and, of course, mass plasticization of components. While light weight is always welcome, cutting out the fat has also meant curbing originality. 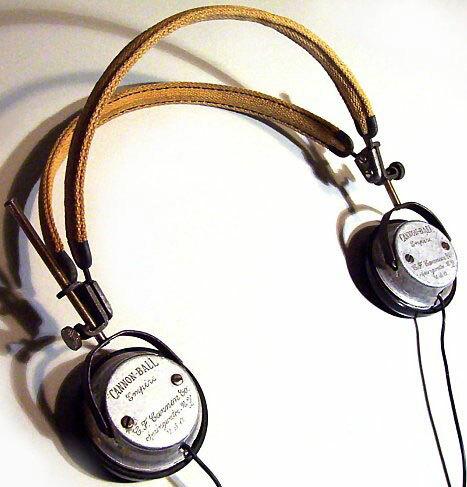 Not so with the vintage-look headphones created – on a budget, yet – by Steampunk artist Molly “Porkshanks” Friedrich and displayed at the Steampunk Workshop. This illustrated tutorial shows how to retrofit & gentrify most any old pair of headphones with modern parts. Classic look outside; classy sound from inside. It’s a great way to bring past and present together without involving a wormhole. Love it or hate it, the Bluetooth earpiece is here to stay – and it’s looking less futuristic everyday. 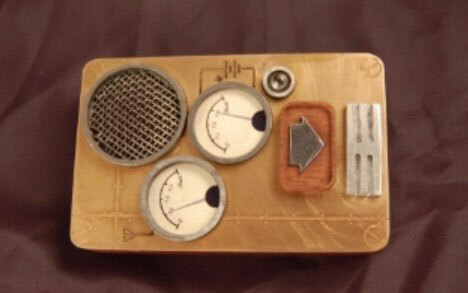 Should that trend continue, the logical result would be the Steampunk mechanical aural communication device. 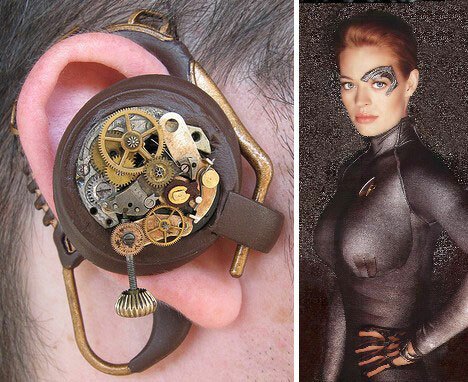 Though the garish and gearish earpiece above is non-functional and just for show, sooner or later some basement inventor will craft one that will make you look like a Victorian Borg. You WILL be assimilated, so have a spot of tea in the meantime. The cellphone is one of today’s most universal mod cons, and it sure does look it. Granted, phone designers have a small space to work with and a barrage of tech tools to implant within. 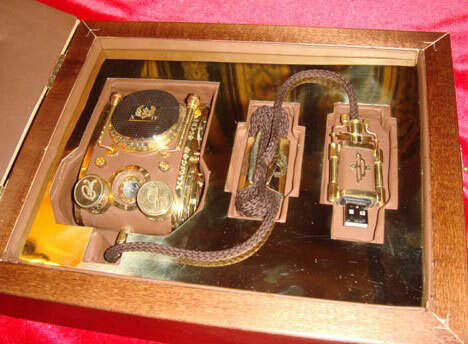 That’s what makes the Steampunk Cellphone above so special – it dispenses with GPS, texting capability and other things that the average E.T. (English Telecommunicator) wouldn’t phone home with anyway. Arthur Schmitt’s wooden wonder runs, as it were, on punch cards – something this writer hasn’t used since Mr. O’Grady’s math class back in ’72. 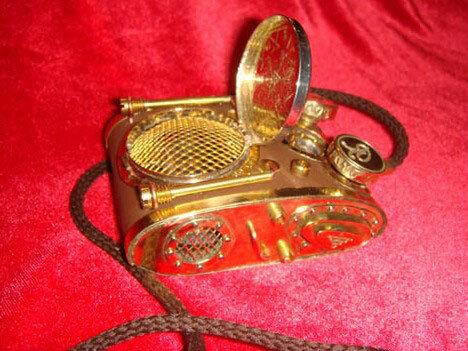 Making a Steampunk Mouse that functions as it should is a much simpler proposition since a mouse is a much simpler device. Even so, the elaborate brass & leather mouse shown above looks as luxurious as a Faberge Egg, and rightly so as it was crafted by a Russian devotee of Steampunk. Or “Stimpank” as the Siberians say. 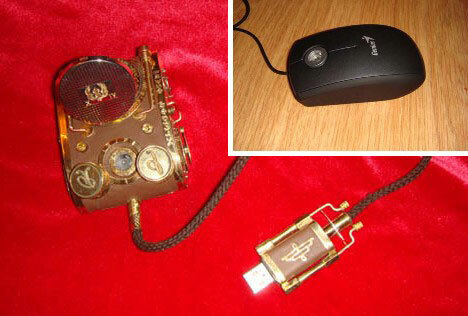 Filimon, the creator of this mouse-terpiece, administers a forum on “Modding of the outlying devices” that claims to be registered in the USSR – now that’s retro. The attention to fine detail is unmatched, even down to the braided connecting cord and exquisite USB connector, packed in a custom made faux-gilded box. Putin on the Ritz, indeed! 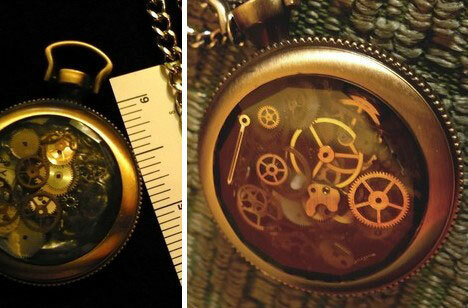 Form following function is not the Steampunk way, and the gear-licious pocket watch above is a perfect example. The $43.00 watch is for display only as it’s likely the owner is already wearing a digital ticker on his/her wrist. Glass, gears and an optional chain complete the classic look of this very watchable watch. Does the all show, no go nature of the device make one a pretender? It doesn’t matter – now you have Brass In Pocket while listening to it on the radio. 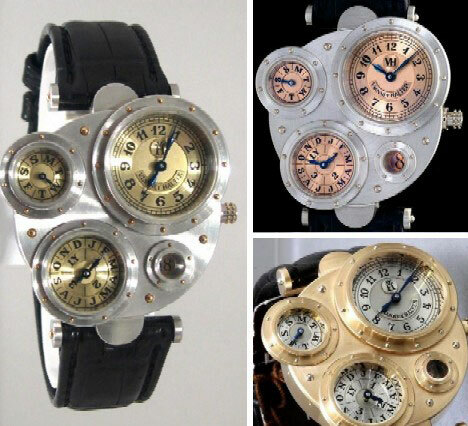 Vianney Halter makes a variety of industrial styled wristwatches that DO work, even though they often resemble turn of the century pressure gauges more than actual chronometers. The trio of “Antiqua” models above are variations on the same multi-dial theme. 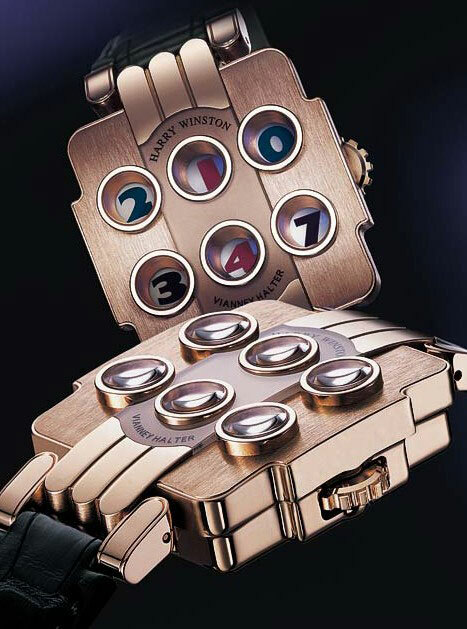 Vianney Halter also crafts watches for Harry Winston, with the Opus 3 shown above. Timelessly styled, if we may say, the Opus 3 features a platinum or rose gold case and a 53 jewel movement. Flaunting Steampunk regalia may be cool, but it could also have an unwanted side effect – attracting the eyes of covetous have-nots. 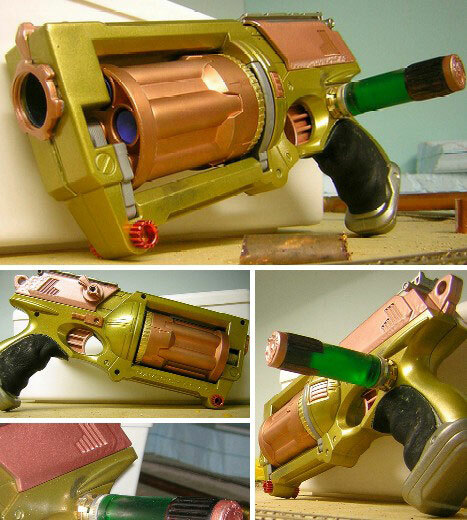 That’s where the Steampunk Nerf Maverick comes in mighty handy. So what if it only shoots Nerf bullets; nobody wants the business end of this bronzed blunderbuss bearing down on them. Let there be light! 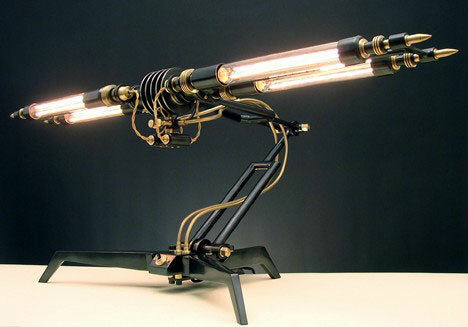 Not just any old light, Steampunk styled old light! Frank Buchwald’s machine lights evoke a sooty air of industrial revolution tempered with a dash of Wellsian space drama. 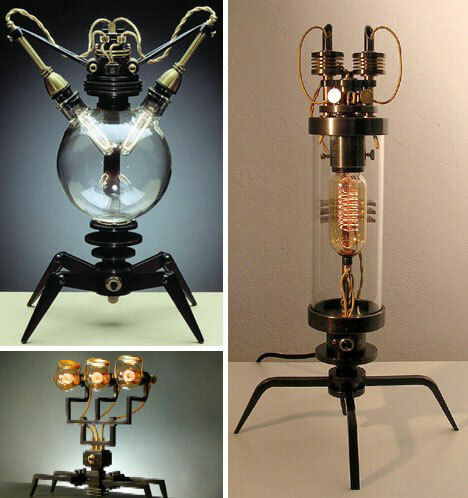 Buchwald crafts his fully functional illuminators – “lights” somehow just doesn’t cut it – from quality materials such as burnished brass & steel, textile cables and unusual yet non-custom bulbs. The result: stunning fixtures that Tesla himself might use to do a little, er, light reading beneath. A little light music? 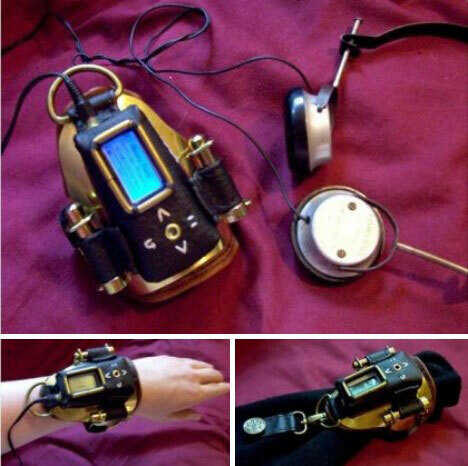 Well, the latter is on tap thanks to The Ambiance Enhancer, a dashingly deco wrist-mounted MP3 player designed by someone with a very un-Steampunkish name: Porkshanks. The player began life as a SONY MDR-006 player but with a little sheet brass, brown leather and… well, Porkshanks goes through the process step by step for those who seek to follow the trail she’s blazed. 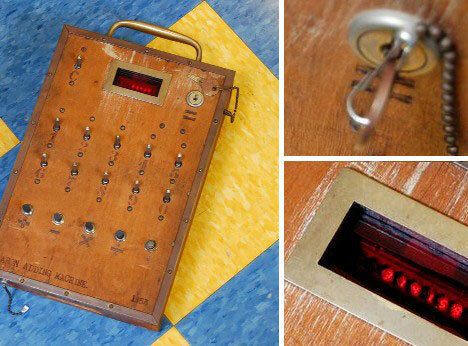 Sometimes it takes just one component to turn a gadget from mainstream to Steampunk. 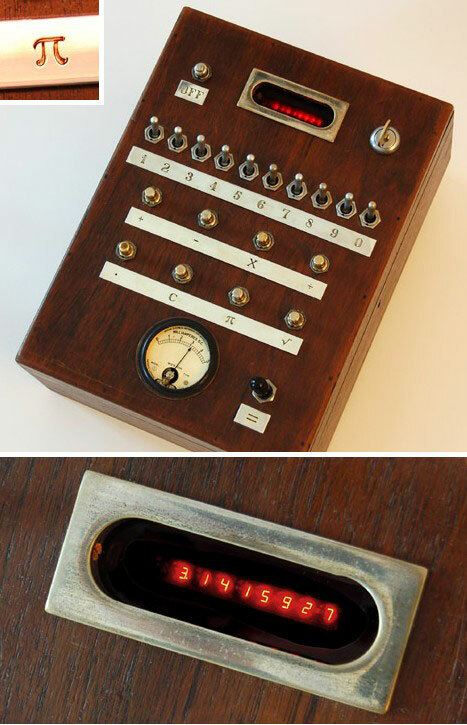 In the case of the above desk clock, it’s Nixie tubes. Seriously, the tubes are in the case. 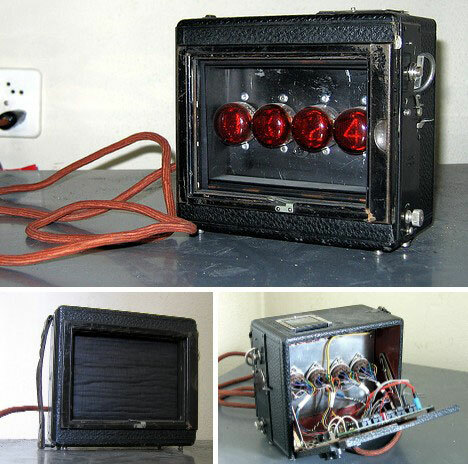 Anyway, Nixie tubes are finicky beasts that demand special care concerning their power supply – probably why they’ve been replaced by LEDs and LCD displays. Finicky or not, the tubes lend an antique aura to this clock that complements the old camera it’s built out of. Perhaps the most outstanding example of modern technological blandness is the digital calculator. Hailed as a wonder in the 1970s, they evolved to be smaller, lighter, and to run on miniature solar cells instead of batteries. This is good, no? No… not to those who appreciate all things Steampunk. 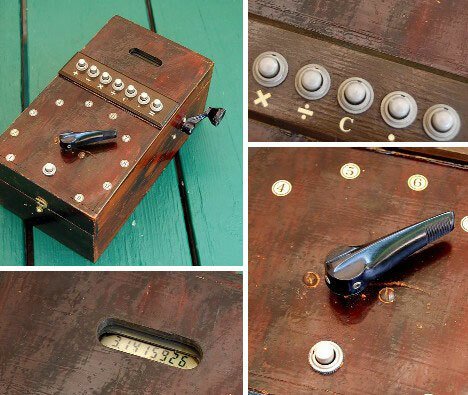 Andy Aaron is most definitely one of “those”, and his delightfully retro Aaron Adding Machines are the antithesis of today’s sleek, near-disposable pocket calculators. Aaron cranks out less of his creations in a year than Sharp stamps out in a couple of seconds. This IS good, because each unique device displays the hand-built luster and “use what you got” tooling that make Steampunk design so appealing. Toggle switches, ball chains and vintage components come together in a quiet riot of richly antiqued brass and distressed wood. Some of Aaron’s calculators are so cumbersome they have massive grip handles by which to lug them about. It might not be easy to take these machines anywhere, but it’s certain you’ll never take them for granted… which is really the essence of what Steampunk design is all about.